sumptuous suppers, heavy drinking and naughty entertainment. The freedom to perform dirty songs and recitations was partly due to the fact that the audience and the actors were always composed of men only. With the growth of the music hall, the old cellar ‘singing-rooms’ would gradually disappear. Arbitrarily, I’ve decided to begin the journey in Maiden Lane, between Covent Garden and the Strand (see street map, right). 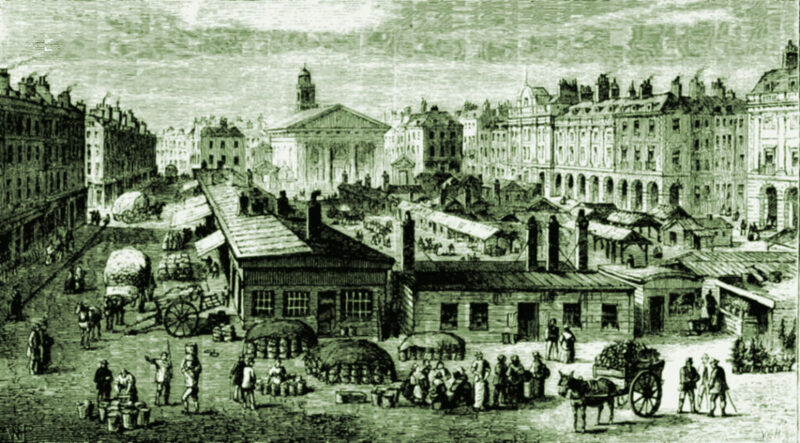 Built over an ancient track that ran from Drury Lane through the (then) Convent Garden to St. Martin’s Lane, and residential from the early 1630s, Maiden Lane is likely in its early days to have been used as a bridleway for horse-drawn carts laden with fruit and vegetables for the small open-air market that by 1654 had developed on the south side of the fashionable piazza. 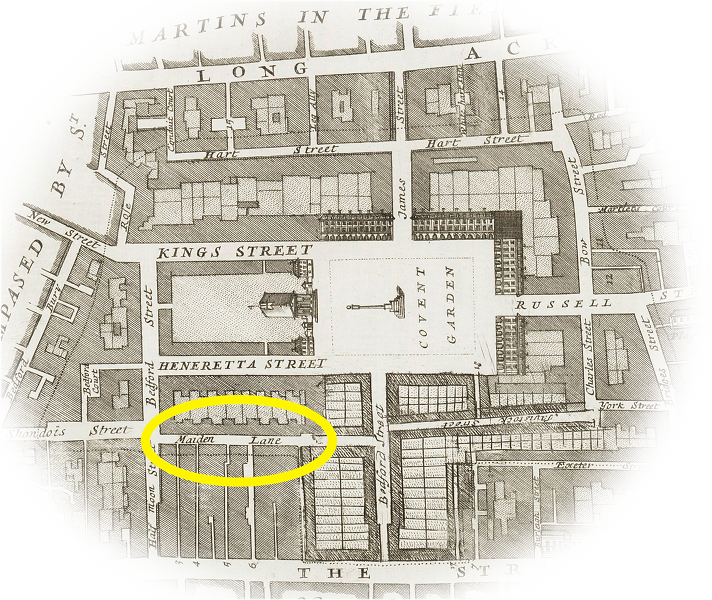 Both the market and the surrounding area would soon fall into disrepute, however, as taverns, theatres, coffee-houses and brothels opened up, the gentry moved away, and rakes, wits and playwrights moved in. By the 18th century it had become a well-known red-light district, attracting notable prostitutes. The narrow street would nonetheless become home to some famous names. Fallen on hard times, the metaphysical poet Andrew Marvell moved into what is today number 9 Maiden Lane in 1677, dying there a year later. 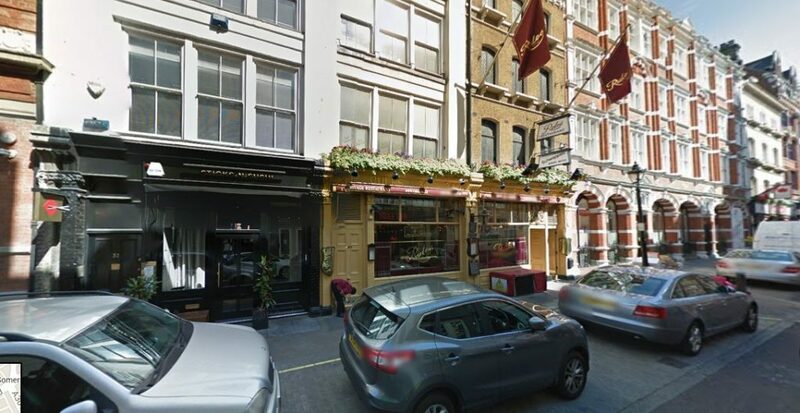 In 1727-28, Voltaire, exiled from Paris, stayed at the White Wig Inn on the south side of the street. The future Edward VII would, while still Prince of Wales, frequently entertain his mistress, Lillie Langtry, in Rules restaurant at 35 Maiden Lane, the oldest (opened 1798) eating establishment in London. The painter J.M.W. Turner, son of a barber and wig maker, was born at present day number 21 Maiden Lane in 1775. And if J. Ewing Ritchie, writing in 1858 (The Night Side of London), is to be believed, the house standing at that very same address had once been the residence of Nell Gwynne. 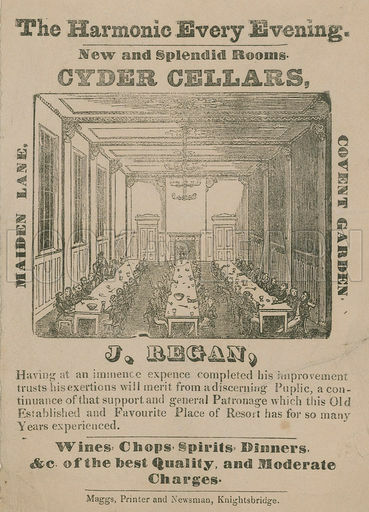 But our principal interest in this article will lie downstairs from Turner’s birthplace, in the basement of 21 Maiden Lane where, in 1720, a new tavern, the Cyder Cellars, would open. “No doubt many were the ingenuous youths who went to the Cyder Cellars to see the learned Mr. Bayle, or the great Grecian Porson, or the eminent tragedian Mr. Edmund Kean, and thought it a fine thing to view those distinguished men maudlin, or obscene, or blasphemous, over their cups”, writes Richie; for the establishment was to be famed above all as a drinking den and brothel, and as one of the earliest recorded song-and-supper rooms. would be incomplete without some mention of Thomas Hudson, one of the earliest and not the least talented of vocalists, who helped to make these and the other song and supper-rooms of the day popular among the most fashionable circles. ‘Tom’ Hudson, as he was called in convivial circles, was a man of considerable literary ability, and the author of many popular songs, some of which continue to be chaunted to the present day. … Many of Hudson’s songs, such as ‘Jack Robinson,’ became coined into catchwords, and were current among the street sayings of the day. 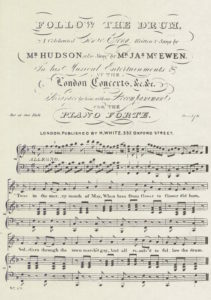 the writer of half the comic songs that once amused festive London … Hudson was one of those professional song-writers and vocalists who used to be engaged to sing at such supper-rooms and theatrical houses as Offley’s, in Henrietta Street (north-west end), Covent Garden; the Coal Hole, in the Strand; and the Cider Cellars, Maiden Lane. Sitting among the company, Hudson used to get up at the call of the chairman and ‘chant’ one of his lively and really witty songs. The theme we’ve offered for our concert performance next Saturday and Sunday at the Milton Keynes Museum’s Victorian Weekend is ‘The Rise and Decline of Music-Hall’, for which María has rehearsed a new song, the aforementioned Hudson’s ‘Follow the Drum’. I’ll shortly be writing more on the song-and-supper rooms; and on how music-hall developed in the 1850s as a distinct form of entertainment. Meanwhile, we’d love to meet you in Milton Keynes next weekend–why not come and join us? Hudson, Thomas. (1818). Comic Songs. London: Gold & Walton. Ritchie, J. Ewing (1858). The Night Side of London. London: Tinsley Bros.
Timbs, John (1866). Club life of London, with anecdotes of the clubs, coffee-houses and taverns of the metropolis during the 17th, 18th and 19th centuries. In 2 volumes. London: Richard Bentley. Thornbury, Walter (1873). Old and new London : a narrative of its history, its people, and its places, Volume 1. London: Cassell, Petter, & Galpin. Stuart, Charles Douglas & A. J. Park (1895). The Variety Stage: A history of the music halls from the earliest period to the present time. London: T Fisher Unwin. Shelley, Henry C. (1909). Inns and taverns of old London : setting forth the historical and literary associations of those ancient hostelries, together with an account of the most notable coffee-houses, clubs, and pleasure gardens of the British metropolis. London: Sir Isaac Pitman & Sons, Ltd.
‘Henrietta Street and Maiden Lane Area: Maiden Lane.’ Survey of London: Volume 36, Covent Garden. Ed. F H W Sheppard. London: London County Council, 1970. 239-252. British History Online. Web. 30 May 2016. Harskamp, Jaap (2009). ‘Underground London: From Cave Culture Follies to the Avant-Garde’, Electronic British Library Journal.